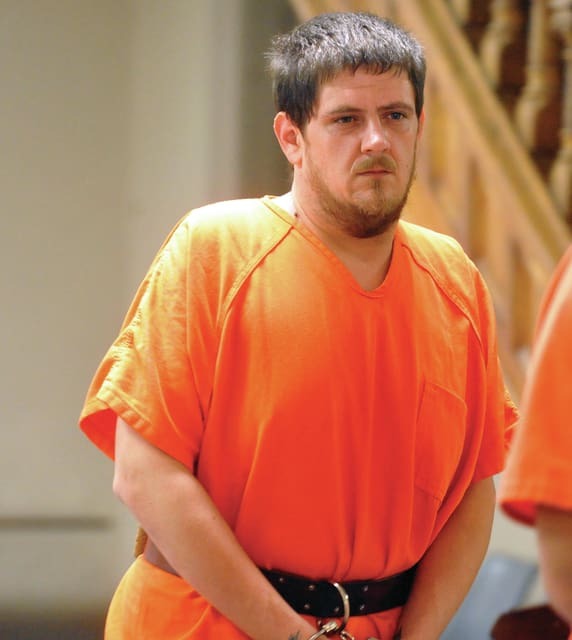 Richard Terrel, 35, of Tipp City enters the Miami County Courthouse on Thursday. MIAMI COUNTY —Blunt force trauma was the cause of 88-year-old William York Sr.’s death, Tipp City Police detective Sgt. Chris Graham announced on Thursday. York’s remains were found in a sleeping bag in Gunpowder Creek in Union, Ky. on June 3. Court records implicate York’s granddaughter Hope Earnshaw-York, 24, and her boyfriend, 35-year-old Richard Terrel, both of Tipp City. Neither one have been charged with a crime related to William York Sr.’s homicide as of press time. On Wednesday Miami County Prosecutor Anthony Kendell said he was presented the case file on William York Sr.’s alleged homicide by authorities and it is currently under review. Terrel was arraigned on charges of fourth degree felony receiving stolen property and fifth degree felony theft in Miami County Municipal Court on Thursday. Those charges stemmed from Tipp City Police investigation of the theft and sale of guns belonging to York which was reported in May. Terrel waived his right to a preliminary hearing and the case was bound over to the Miami County Common Pleas courts. Miami County Municipal Court Judge Gary Nasal continued Terrel’s bond at $150,000. On Tuesday, York’s granddaughter Hope Earnshaw-York, 24, of Tipp City, was arraigned on three counts of receiving stolen property related to three guns which were stolen from York and later sold to a gun dealer. She pleaded not guilty to possession of heroin charge on Monday. Her bond has been set for $160,000. On May 10, York reported to Tipp City police that seven guns were missing from his gun case. He did not want to pursue further action at that time, saying that he wanted police to know the firearms were missing. On June 4, Tipp City Police Department confirmed that the body found in a northern Kentucky creek was York who was reported missing from his Evanston Road home on May 30. In the months before his death, York contacted Tipp City Police twice about items he believed were stolen from his home. On May 10, York reported to Tipp City police that seven guns were missing from his gun case. He did not want to pursue further action at that time, saying that he wanted police to know the firearms were missing.